Ellen Street Restaurant has been open for about a year and half now – so why didn’t I find out about it until a few weeks ago!? Never mind – better late than never – and what a find! Tom Boden sure can cook! You’ll find Ellen Street at Maxwell Wines on the rise of a hill, with large windows overlooking McLaren Vale vines. It’s a fantastic outlook. It’s named Ellen Street as this is what the old street used to be called. The building is pressed sandstone, limestone and timber with a clay tiled floor. At one end there’s the nicely busy cellar door, and an open fireplace separates this area from the dining room. There’s also a sizeable outdoor eating area. As beautiful as the building and outlook may be, it’s chef Tom Boden’s food that makes Ellen Street extra special. Tom’s had years of international experience including Michelin-starred ‘The Black Rat’ in the UK, and more recently Coast in Sydney, Eden in Adelaide, and a short stint at McLaren Vale’s Elbow Room. Tom enjoys basing his food on fresh, local and seasonal ingredients. I was warmly greeted by manager Jess Fargher who’s both friendly and professional. She immediately hands me a menu to peruse while I’m waiting for the others to arrive. I liked that, as I was super-keen to see what was on it. It’s made up of a small number of Snacks, Entrees, Mains, Sides, Cheeses and Desserts. Or, there’s ‘The Street Experience’ – a chef’s choice degustation at $75pp. I start salivating. The others arrive and after a natter, we decide to make up our own degustation. Being McLaren Vale-ites, they’d all been before so I was happy to be guided by them. We start with a couple of snacks – firstly, the Deer Dog which was a really good meaty venison sausage served hotdog style. Being an avid ‘sausage-ophile’, I know a good sausage when I see it! We divided it into four so we could all have a taste. Next, the Barramundi Bun. How good does that sound?! It didn’t disappoint – beautifully fresh barramundi in a light golden batter in a bun with lettuce and mayo. Such a good start! We moved on to a selection of entrees – in fact we requested all four entrees to share. The Blue Swimmer Crab with Fennel Lavosh and Caviar is a nicely balanced dish. The lavosh is made with fennel seeds – the dough is made into thin sheets and then baked until golden and crisp. It sits atop a crab mixture topped with lumpfish caviar. Great flavours, but at the same time still subtle. The Young Root Vegetable Salad with Goat Curd Labne was a nothing short of a work of art. The labne was creamy and topped with local baby vegetables – carrots, brussel sprouts, cauliflower, swede, and beets. Gorgeous. I absolutely loved the Seared Ox Tongue on Remoulade. The tongue had been poached, sliced and then seared on the chargrill, sitting on shredded kohlrabi and cabbage in a remoulade dressing. The tongue was juicy and tender. Loved this dish. The Jerusalem Artichoke Soup with Chorizo was so warm and comforting on a cold day. That unique Jerusalem artichoke flavour with an abundance of chorizo chunks – a meal in itself. The wine list, as you would expect being at the winery is… Maxwell wines. To accompany our entrees we decided on a bottle of chardonnay from the museum wine list – a 2008 Adelaide Hills number. Full bodied and nice and golden. For our final savoury course we went for the Adelaide Hills Fallow Deer, Pancetta, Winter Vegetables and Spinach. I’d seen this dish being delivered to other tables and it looked magnificent. 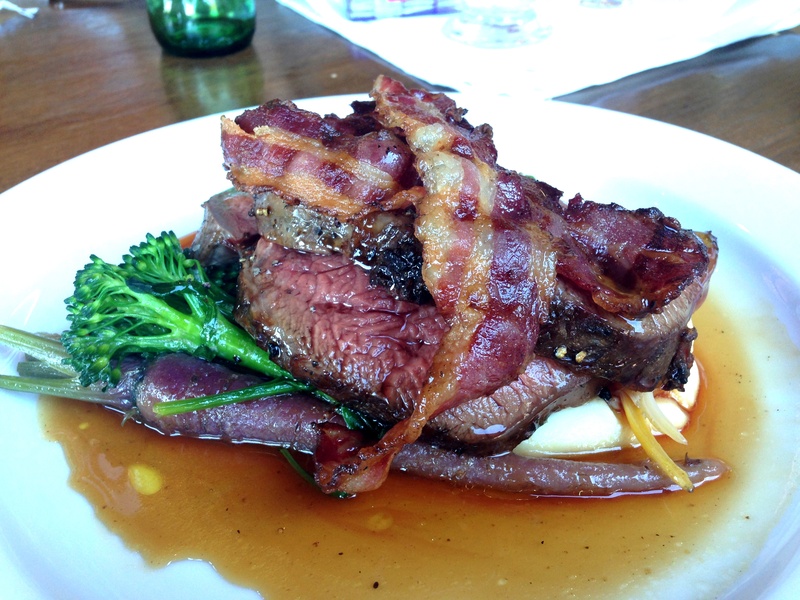 Slabs of venison served with crispy pancetta, beetroot, broccolini, spinach, puree and a mighty fine jus. The venison was just a little bit chewy, but apart from that, a pretty much perfect dish. And then to finish – the Banana Cake with White Chocolate Parfait, Orange Marmalade and Chocolate Jaffa Mousse. I would definitely have that again, and I don’t even like desserts! Maxwell’s Ellen Street Restaurant is a must-do for your next McLaren Vale trip. It’s got everything going for it. The setting, the wines, the service, and of course, the food, which is a little bit fancy but not at all pretentious – and importantly, it’s all so delicious! We love this restaurant, Toms food is amazing and we just love the crab dish, but the magic he has with his dishes is destination flavour. Jacqui, thanks for sharing our local food haven.!! !